Be the first to share your favorite memory, photo or story of Mrs. Amy Crayton. This memorial page is dedicated for family, friends and future generations to celebrate the life of their loved one. 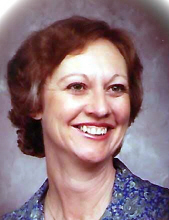 Mrs. Amy Crayton Hale, age 77, of Dallas, Georgia, passed away on Tuesday, April 9, 2019 at Kimberly Personal Care Home (Dallas, Georgia). Mrs. Hale was born on February 10, 1942 to George Crayton and Desser (Brown) Crayton. She was a member of the Dallas High School Class of 1960. She was a member of Mt. Olivet Baptist Church. Prior to her passing, she worked as a customer service representative for Allstate Insurance. She was preceded in death by her husband of 49 years, James Hale and her parents, George (Desser Brown) Crayton. Amy is survived by her son, Ryan (Teresa) Hale; her son, Corey (Ida) Hale; her grandchildren, Jeremy Hale, Jamie Hale, and Jameson Hale. Funeral Services for Mrs. Hale will be held on Sunday, April 14, 2019 2:00PM at Benson Funeral Home. Betty Hoptroff, Connie Turner and Ryan Hale will be providing the eulogies for the service. Interment will follow at the Paulding Memorial Gardens. The family will be receiving friends on Sunday, April 14, 2019 from 12:00PM - 2:00PM at Benson Funeral Home. In lieu of flowers, the family wishes for donations to be made to the Alzheimer's Association. To send flowers or a remembrance gift to the family of Mrs. Amy Crayton Hale, please visit our Tribute Store. "Email Address" would like to share the life celebration of Mrs. Amy Crayton Hale. Click on the "link" to go to share a favorite memory or leave a condolence message for the family.